It needs to be said upfront: I’m not a karaoke fan. In the video Pet Shop Boys performing Leaving. 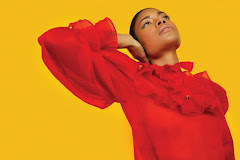 In the photo Naomie Harris hotographed by Simon Emmett. Soure GQ Turkey. Photo caption from Karaoke Culture by Dubravka Ugresic. Title by Mascotes. Pet Shop Boys, West End Girls, Les Mascotes, 19 February 2011.